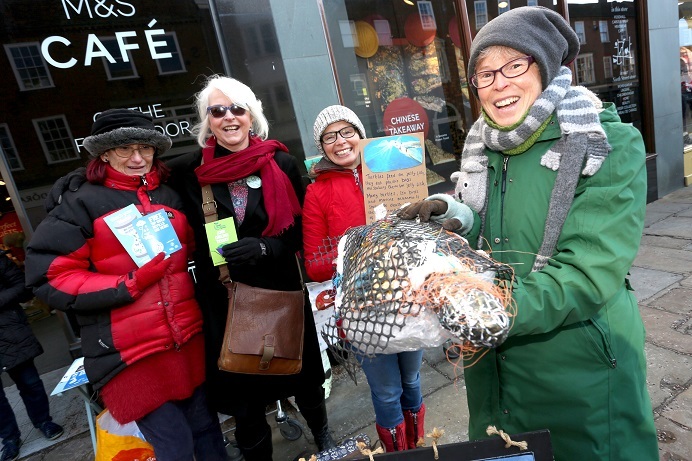 PLASTIC returners gathered outside Marks & Spencer in East Street, Chichester, on Saturday, to encourage more visitors to the city to reduce waste. Despite a very cold morning, the manager and staff of M&S gave campaigners a warm welcome and encouraged them in their efforts. Their deposit bottle scheme petition picked up many signatures and the group was pleased to be able to engage a lot of chilly shoppers in discussion about how and where to recycle different sorts of waste products. Campaigner Lucinda Gibson-House said: “We gave out lots of information leaflets and explained about the plastic water bottle refill scheme as well. “The manager of M&S spoke to us about some of their initiatives to cut back on waste and reduce plastics in store, including replacing all plastic cutlery in the café, offering non-plastic cutlery at the tills and a new initiative to offer different, longer lasting, reusable bags. Sarah Sharp, city councillor for Chichester south, who brought the issue of single-use plastic to the city council in December, also wants people to do more in 2019 and get involved with recycling company, TerraCycle. TerraCycle’s idea is to recycle the non-recyclable, from coffee capsules to pens, to plastic gloves. Cllr Sharp said: “This was the third #returntheplastic event organised locally and it is proving a continuing success. “People want to do more. Customers want to know where to bring their ecobricks and how they can get involved. “We are hearing little actions undertaken by each different supermarket but we can’t stress enough the enormity of the problem and how we collectively need to do more. “I have contacted several schools about the Terracycle Scheme which is already being supported in Lavant School and Tangmere Dental Practice. Bognor Regis and Chichester #returntheplastic is an active group planning regular events outside different supermarkets on the first Saturday of every month. In December, the group campaigned outside Tesco’s in Bognor Regis and in January they went to Sainsbury’s in Chichester. Last month, Chichester officially launched its refill scheme programme to encourage participating cafes, bars, restaurants, banks, galleries, museums and other businesses to sign up to the free Refill app and put a sticker in their window alerting passers-by to the fact they’re welcome to fill up their water bottle for free. The initiative would help to see a reduction in single-use plastic bottles being purchased and thrown away. If you would like to find out more about the group or are interested in helping, please see their Facebook page or contact Sarah on: 07789843556 if you would like to help with the petition. Alternatively, shoppers can join the nationwide campaign and take individual action to leave plastic waste at the till after having bought goods. This acts as a clear message to supermarkets that they need to take radical action to introduce more compostable and sustainable packaging and cut down on our reliance on single-use plastics.